The Nun: Thou Shalt Not Be Habit-forming. A group of alumna from a Catholic boarding school start dropping dead across the globe under strange circumstances. The daughter of one of the deceased, Eve, travels with friends to the school in Barcelona to find out the whole story, and meet some of her mother’s surviving classmates. Those not-yet-knocked-off and the young travelers end up at the boarding school, where the spirit of Sister Ursula is none too pleased. Overall, The Nun (2005, dir. Luis De La Madrid) falls smack in the middle of the horror spectrum, from blood-curdling to belly-laugh. What I find most interesting about The Nun, however, is how it takes a perfectly creepy premise and stretches it to its outer limits, thus damaging what started as a perfectly solid horror flick with religious undertones. Catholic school flashbacks – check. Protagonists with warped senses of spirituality – check. Sabre-toothed, undead nun in full European habit, circa 1960 – check. All of the elements of fear are nicely set in place. Throw in a few good-looking teenaged actors with relatively good chops and you’ve got a winner; just put the camera on autopilot, Mr. Director (who is also probably Mr. Writer and Mr. Producer). We don’t need any more crazy in this movie, we’re all stocked up. But nay… directors can never keep their hands off of things, can they? Enter the twist … way too late in the film, and poorly explained. It’s almost like the twist is an after-thought; push it a little further, and there might have been something to salvage. But leave the plot alone as is, and The Nun would have sailed through Catholic-school-hell with ease. Here are some of the highlights: The Nun takes a valiant stab at that tried-and-true horror staple of fear through the addition of complicated religious beliefs. As we all know, The Exorcist is and will likely remain the Godfather of this genre. The Omen isn’t too shabby either. Moreover, what The Nun has that other films is an intriguing vehicle for the villain – literally. 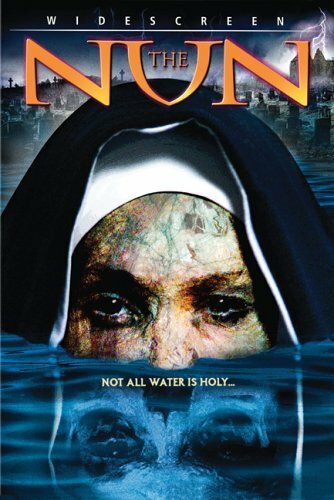 Undead Nun Ursula can only travel through water, as she was drowned, so she appears through drains, stagnant pools, what-have-you. This makes for some sick visual effects, and a particularly pasty, water-logged looking Ursula. In addition, the cinematography in general is great in this film, from grainy hand-held shots to panoramas of Spain, to night-vision shadow-chasing in the abandoned boarding school. The live-action underwater shots are also downright pretty. There are some loose ends left untied and a few too many subplots for the sake of subplots – but overall, The Nun is a good rental, saved by its visual effects and less-than-stale storyline. I also appreciate that Sister Ursula doesn’t take the easy road and kill people by, you know, drowning them. I hate it when the undead nuns go for the obvious stuff.